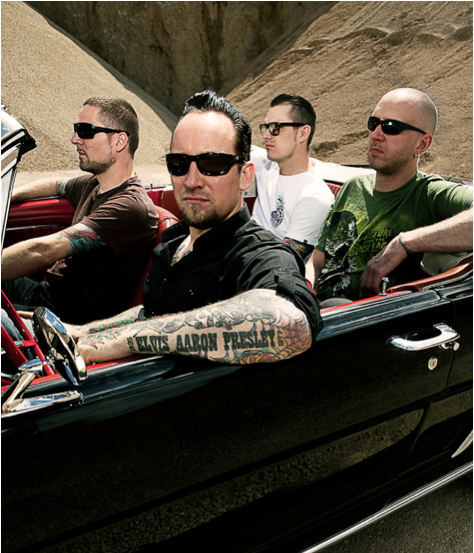 Volbeat was formed in 2001 after frontman Michael Poulsen split up his former band,Dominus. Volbeat plays a fusion of heavy metal and rockabilly. They are inspired by the rock n’ roll legends Elvis Presley and Johnny Cash. No other Danish heavy rock band Volbeat has been able to get to position 18 at the Danish Top 100 for CD sales in over 10 years. This milestone was reached after their concert at the Roskilde Festival 2006. Critics have generally been positive towards The Strength / The Sound / The Songs. The German hard rock magazine RockHard gave it 10/10 in a review. Volbeat is also praised for its live performances. Their concert at Roskilde Festival 2006 received a 6/6 stars review in the Danish newspaper BT. In week 8 of 2007, the record Rock The Rebel / Metal The Devil debuted as #1 in the Danish Top 40 for CD-sales and at the same time The Strength / The Sound / The Songs re-entered the chart at #21. Recently, the album achieved gold status for sales in Denmark. Volbeat opened the Roskilde Festival in 2007. Volbeat also supported Metallica together with Mnemic at their concert on Denmark July 13 of that year. More recently, Volbeat was announced to do a seven-date European spring tour and to support legendary speed metal act Megadeth in Finland and in their home town, Copenhagen. They have also already announced a few festival appearances for the summer 2008. Volbeat’s lyrics usually revolve around love, failed love or the power of a twisted mind. They thereby distance themselves from stereotypical heavy metal lyrics, although many of their most popular songs have very dark or sincere themes and plots. Their first single was the cover version of Dusty Springfield’s evergreen “I Only Wanna Be With You”. The song doesn’t differ much from the original with regard to the lyrics, but the accompanying music video is quite typical of Volbeat. In it, the band is seen with a classic microphone on top of a city roof. Another popular feature of the band’s lyrics are the returning “series” of songs. This is best represented with the songs “Danny And Lucy” from The Strength/The Sound/The Songs followed by “Mr. & Mrs. Ness” on Rock the Rebel/Metal the Devil. The story is about the two desperate lovers, Danny and Lucy, who are killed in a car crash after Lucy runs away from her family.